“The National Museum of Dance has announced the 2015 Mr. and Mrs. Cornelius Vanderbilt Whitney Hall of Fame Inductees — Mark Morris and Rudolf Nureyev,” reported the Saratogian this week, which like the National Museum of Dance, is located in Saratoga, NY. The hall has more than 50 inductees and is one of the permanent exhibits at the museum. One of the most acclaimed works by choreographer Mark Morris, L’Allegro, Il Penseroso ed il Moderato, comes to television for the first time on Great Performances, Friday, March 27 at 9 pm on PBS (check local listings). See the preview, below. Mark Morris. Photo by Amber Star Merkens. Mark Morris was born on August 29, 1956, in Seattle, Washington. 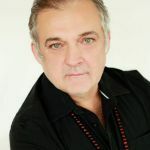 He performed with the companies of Lar Lubovitch, Hannah Kahn, Laura Dean, Eliot Feld, and the Koleda Balkan Dance Ensemble before forming the Mark Morris Dance Group (MMDG) in 1980 and has since created close to 150 works for the company. From 1988 to 1991, he was Director of Dance at the Théâtre Royal de la Monnaie in Brussels, the national opera house of Belgium. In 1990, he founded the White Oak Dance Project with Mikhail Baryshnikov. Rudolf Nureyev (1938-1993) performed for three years with the Kirov Ballet in the Soviet Union before defecting to the West in 1961. He performed with the Royal Ballet in London until 1970, when he began focusing on international appearances before joining the Paris Opera Ballet. Great Performances aired Nureyev: The Russian Years in 2007 (trailer, above). The film documents Nureyev’s humble beginnings, his late start as a dancer, and his relentless quest to become the best and most famous ballet dancer in the world. It also presents life in communist Russia and the role of the government in controlling virtually all aspects of its people’s lives that caused some, like Nureyev, to defect.